Hers the life the soul had wanted you to lead? Is a kind of dying. Or even very possible to do. In each moment of one’s own. 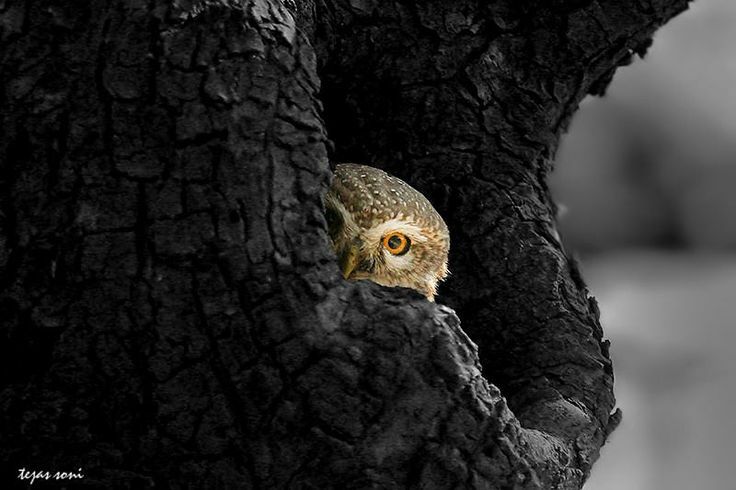 “Athene Brama” responds directly to the astonishing photograph by Tejas Soni, which my love Anne Walsh found on The Owl Pages and sent to me. We have a trade in owls, a call and response, whose currency is love. Studying the owl’s face in the photograph and thinking about her name tripped me up into writing what I thought I felt and saw. The wild, especially the feathered wild, is uncanny and compelling to us humans, caught in the cages of our consciousness and socialisation, especially this deep into the anthropocene. I have a feeling my poem looks and utters too directly only a little of the oracles the owl’s silent utterance spoke to me so slant and (multi)valenced, so free of artifice. But perhaps it is only ever the ground between that the poem sings—the trajectory and timbre of what is almost always lost in translation between each wild moment, or each wild heart or being, and our halfway-domesticated witnessing selves. Whatever else this poem of mine is and does, written at a desk in a sunroom high above the beaches of Newcastle, where my companions are figbirds and frogmouths and black-faced cuckoo shrikes and pelicans and above all the voluble pigeons, I hope it celebrates an owl, our owl natures, and a work of art. My hope is that it does that in what it says and how it speaks and how it takes the page. And if it also catches the lyric of a deep human longing for an immaculate, useful and implacable life, I’ll be happier still. Especially on my birthday. Mark Tredinnick’s latest collection of poems Almost Everything I Know (Flying Island), is to be launched on 21 February at Gleebooks. The book is a selection of new and selected poems, featuring the poem “Owls,” from which the book’s title comes. The cover features a super closeup painting of an owl by German tattooist and painter Stefan Aumüller. Most importantly, the book is bilingual; the translations to Chinese are by award-winning Australian writer Isabelle Li. Note: A huge thank you to Tejas Soni for the privilege of using this amazing photograph. Do check his work on http://500px.com/TejasSoni or his Facebook page. Tags: art, forest, love, owl, photography, poem, Poetry, soulful, spirituality, wisdom. Bookmark the permalink. Dying every second of every moment lived, I enter all the way, Owl A and find you where we’ve always been. We, the slant oracle of love on a trade of wings. The worlds in a bird’s eye. The always is. Ho, Beloved. Owl B. This poem reminds me of a beautiful and intense person I know. He’s strong and tender at once, with strong and warm eyes not unlike the owl’s.